The Most Healthy Yogurt In Existence? Greek yogurt is one of the latest health food crazes – but is it really better for you than any other type of yogurt? And are all types of Greek yogurt created equal? Read on to learn more about this health food breakfast and power snack. Before we get into the details, let’s talk about what makes Greek yogurt, well, Greek. It turns out that not all yogurts made in Greece are what we might call Greek yogurt… and it turns out that Greece doesn’t have a monopoly on “Greek” yogurt (it’s a traditional food throughout the Mediterranean and as far east as South Asia). Essentially, Greek yogurt is a cultured dairy product that has been strained, giving it a thicker consistency. The straining also reduces the sugar, fat, and carbohydrate content. WebMD calls Greek yogurt one of the “six best foods you’re not eating.” Why? It contains tons of vitamins and minerals that your body needs, like vitamin B6, vitamin B12, zinc, potassium, and calcium. The probiotic content of Greek yogurt also helps improve digestive function (and is especially useful for people who are experiencing antibiotic-related diarrhea, gas, and cramping). Greek yogurt is also an excellent source of protein. According to Bonnie Taub-Dix, R.D., a dietician who discussed Greek yogurt with sheknows.com, Greek yogurt has two times the protein of non-strained (regular) yogurt, and as much protein as a three-ounce serving of chicken. Another bonus: the thick, creamy consistency of even non-fat Greek yogurt can make you feel full and satiated. Since a cup of Greek yogurt is filling, you’ll be less likely to reach for unhealthy snacks later on. As always, there’s a catch. Greek yogurt is often touted as a healthier yogurt alternative because of its low sugar and fat contents, but not all Greek yogurt is created equal. You’ll only be able to get all of the above health benefits without tons of calories and sugar if you stick with plain, nonfat Greek yogurt. But there are plenty of other types you can buy. The surge in popularity of Greek yogurt has led to all kinds of varieties that are heavily sweetened, contain tons of artificial flavorings, and are no better than the most dessert-like of traditional yogurt. Plus, “Greek-style” yogurt is not the same as Greek yogurt. It often achieves its consistency through thickening agents and sugars, not by straining, so the lactose and other natural sugars haven’t been strained out. In fact, it may not even contain active cultures! So, Greek yogurt can be healthier than other yogurts if you buy the right one. The real deal has a higher amount of protein content with less fat. However, it’s important to continue to check your labels, as you may find traditional yogurts that are healthier than Greek or Greek-style ones, at least on an individual basis. Have you hopped onto the Greek yogurt bandwagon, or is this still all Greek to you? 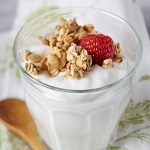 Latest Headlines » Nutrition » The Most Healthy Yogurt In Existence?